Mr. Balai das, final year student of Vishwakarma Institute of Technology, Pune is suffering from Gillion Barre syndrome. He is admitted to Sion hospital mumbai. He was doing his internship at RCF Mumbai. He lost sensation of his lower part below waist. Only medicine is 25 injections (IV) which cost ₹7000 per injection. His one day expenses are around ₹ 35,000. All of you are requested to contribute so that we can raise funds as much as possible. 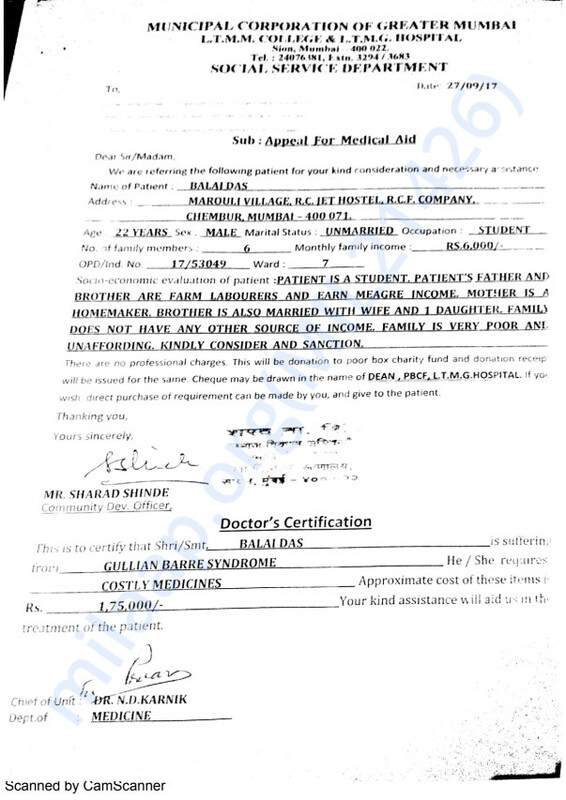 This document involves doctor's certification. My name is Balai Das. 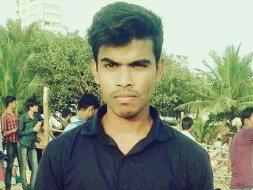 I am currently studying in the final year of Chemical Engineering at VIT college, Pune, Maharashtra. On seventh semester I had gone for the semester-long internship program at RCF Chembur Mumbai. During my internship period, I suffered suddenly with Guillain Barrne Syndrome which was very rare disease. It affected my upper and lower part making me unable to walk and perform my daily activities. I was admitted immediately at L.T. M. M.C. & M. G. H. Sion Hospital, Mumbai. The doctors started treatment immediately, which include expensive medications and vaccines which costs INR 35000 per day. The treatment lasted for 5 days after that the doctors suggested me to do physiotherapy treatment in order to improve my body movement and gain power to do daily activities. I went to my hometown and started physiotherapy treatment with the help of therapist and my family members, I recovered slowly and was able to do my daily activities. After 2 months continuous treatment and exercises I recovered almost 75%. As it takes time to recover completely, I decided to come Pune carry on my studies and inform doctor about the improvement. On 11-12-2017 I went to Mumbai to meet doctor and told about my improvements and treatment I am going through and he suggested to keep on doing the treatment and excises on regular basis and told me that it will recover completely within 2-3 months. As this disease is rare, it has less probability that it may occur in future, I still will visit doctor on every six months.